Life wears on all of us and as a result, we all need to be refreshed in the spirit from time to time, to be filled anew with the Holy Spirit of God. 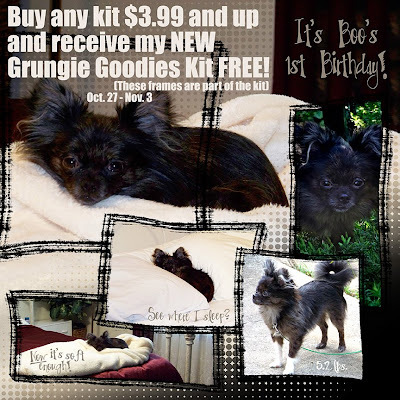 Boo has turned one year old and I'm going to celebrate with a fabulous sale for you! Hasn't she turned out cute? So here's the skinny - everyone who buys any kit in my store (60 kits available now) that's $3.99 and up will receive my brand new Grungie Goodies kit free! Sale now through Nov. 3rd. After this sale you can find Grungie Goodies in the store, so don't be late! Grungie Goodies has 8 large cool Frames (seen in Boo's picture), a Grungie Alphabet with upper and lower case, Numbers & Punctuation, a Swirl, a Border, 2 doodled Flowers and 2 grass clumps - everything in the same grungie look! So now's the time to go grab everything you've been wanting, and don't miss all the fall and winter kits! Happy birthday BooBoo baby - Mommy loves you! Use the Buy It Now Buttons or e-mail me a list for multiple purchases that you only want to check out once for and I'll send you a PayPal invoice. Each night I will e-mail the free kit to everyone who has purchased a kit of $3.99 and up. I made today's gift using my new Roses Kit. Enjoy! 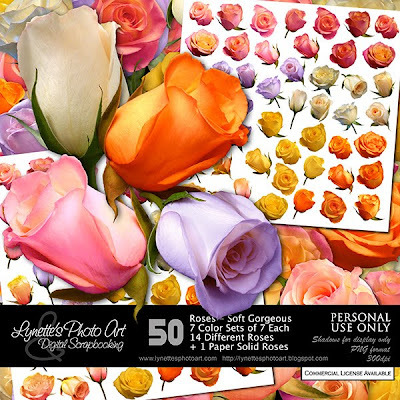 Roses is a HUGE collection of 49 soft, gorgeous roses in seven different color sets of seven roses each and an breathtaking paper of solid roses! (White, yellow, lavender, pink & yellow, pink & gold and a texturized set in yellows, oranges & pinks.) $5.99 in my PayPal store. Click the image to see the exquisite detail. Click the Buy It Now Button below the image to purchase. Today I'm giving you a truly lovely overlay made with this kit - enjoy! The roses are shown actual size on the 12" white sheet in the preview. Thank you! Your blog post will be advertised on the DigiFree Digital Scrapbooking Freebie search engine today (look for timestamp: 27 Oct [LA 04:06pm, NY 06:06pm, UK 11:06pm] - 28 Oct [OZ 10:06am]). Roses are my favourite, thank you! Thank you so much Lynette for today's roses. How cute is Boo - what a beautiful photo .... those big eyes which just melt your heart ... lol ... yeah I know - I'm a softy when it comes to dogs. Thank you so much for this Freebie. I want to let you know that I posted a link to your blog in CBH Digital Scrapbooking Freebies, under the Page 8 post on Oct. 28, 2009. Thanks again. 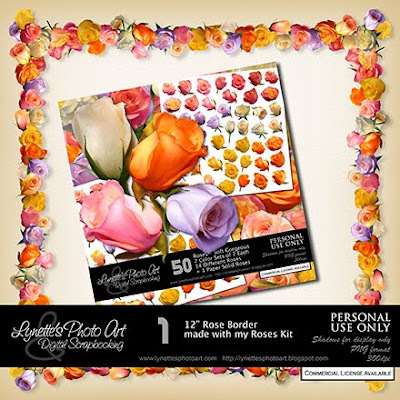 Thank you so much for sharing the beautiful rose border, I really appreciate your thoughtfulness! May God Bless You Abundantly!